Dr. Katz, an orthopedist frequently hired by insurance companies to defend personal injury cases — who has testified that he may make over a million dollars a year just from his medical-legal practice — had testified in the recent case that he likely spent 10-20 minutes on his examination of the plaintiff. A surreptitiously made video, however, revealed that he spent a mere one minute and 56 seconds on the exam and could not have made all the findings he testified about within that short time. The underlying labor law case concerns a severe ankle fracture that resulted in a fusion of the joint as well as a shoulder injury that required surgery, suffered when Manuel Bermejo fell from a Bakers Scaffold. The court indicated that there was potential for a verdict of “several million dollars” based on the injuries. These medical exams are often critical to the defense of personal injury cases, and are also used by insurance companies to “evaluate” whether they should continue to pay No-Fault or Workers Compensation benefits. The reason the exams are often problematic is that the insurance carriers have a vested interest in limiting payments and only retaining doctors that give them favorable reports, and there is no stenographer to record what transpires. Quickie exams that serve only to deny benefits to the injured are a constant problem. But this case had actual evidence in the form of a secretly made video recording. It shows Dr. Katz examining Mr. Bermejo as plaintiff’s trial counsel, who recorded it, and a paralegal-translator looked on. This was the second exam that Dr. Katz had done of Mr. Bermjo, as he had undergone shoulder surgery after the first examination. Plaintiff’s counsel was moved to record this second exam, according to court transcripts, because he believed that Dr. Katz had been dishonest in his report of what transpired at the first one. The initial exam, Dr. Katz claimed, lated 45 minutes and he also claimed that plaintiff’s counsel impeded it. (The paralegal that was present took the stand and sharply disputed both points.) When the time came for the second exam, plaintiff’s counsel secretly recorded it to protect himself from any possible complaints or accusations from the doctor. This secret recording was not exchanged during the litigation, as plaintiff’s counsel said there was no requirement to do so since Dr. Katz was a non-party, and the only potential use of the video was if Dr. Katz perjured himself. When Dr. Katz offered testimony at trial that was completely inconsistent with the actual events, the evidence was submitted to the court. As a result of this video substantively contradicting the trial testimony, and concerned about a breach of the discovery rules and orders by the failure to disclose, Justice Hart declared a mistrial after 2-3 weeks of trial. In a remarkable hearing before Justice Hart after the false testimony had been given, Dr. Katz’s criminal defense attorney stated that the perjury was the fault of the court because the court had demanded the doctor tell the truth in answering the question about how long such exams usually take. Justice Hart characterized this as “the dumbest thing I ever heard” either inside the courtroom or out. All the attorney sanctions were vacated later in the hearing. Justice Hart, in finding that it was the doctor’s false testimony that caused the mistrial, stated that while he had seen abuse of the system before, “This is clearly the most blatant example of a doctor getting up there and just not telling the truth.” He also suggested that plaintiff’s counsel who had spent $40,000 on trying the case so far, should sue Dr. Katz for the expenses and legal fees caused by the mistrial. How do I stop carriers from putting people like Dr. Katz on the stand and causing the state to spend thousands and thousands of dollars trying a case and putting a lying witness on the stand? How do people like me, people in this building, people that wear black robes send a message to them that they cannot condone perjury? It is like a wound that is festering. Every time he does another IME. When is it going to stop? He is making 7 figures a year doing IME’s. Then he comes to my part and lies. The impending denouement of Dr. Michael Katz is all the more stunning since it comes fresh on the heels of his fellow New York orthopedist Dr. Robert Israel being sanctioned for his conduct in medical-legal exams. Dr. Israel had been doing up to 1,500 per year, but has now been barred from doing them for three years. Together, Drs. Katz and Israel have no doubt sent New York’s insurance carriers frantically scrambling, as the two of them were responsible for thousands of insurance exams each year, the results of which are now all thrown into question. The scope and scale of insurance fraud being perpetrated — by the insurance companies themselves — could have resulted in hundreds of millions of dollars in payments being withheld. 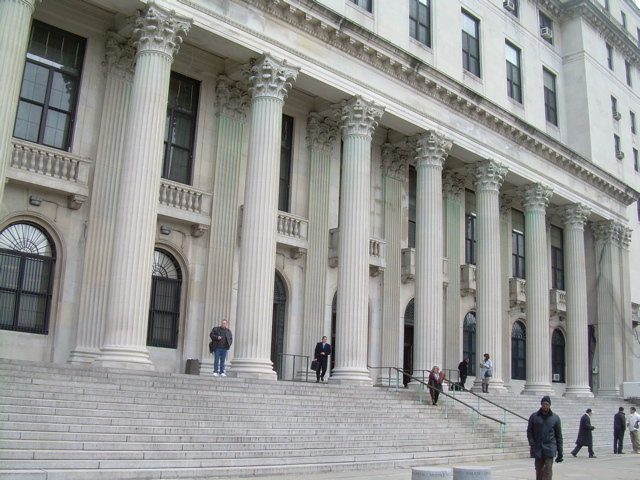 It remains unclear just how many New Yorkers have been fraudulently denied benefits based on quickie exams that were set up to deny benefits and minimize jury verdicts. The scope of such an investigation of the insurance industry, it seems, could only be done by Attorney General Eric Schneiderman. Last week’s hearing regarding Dr. Katz was adjourned until this afternoon (July 8th) at 2:00 pm. It is unclear whether Dr. Katz will voluntarily agree to halt his lucrative medical-examination business — though this now seems like a moot point now since the record regarding his false testimony has now been unsealed. Investigation by the Attorney General into the issue of insurance fraud perpetuated by the insurance industry. I can blame the attorneys and the carrier who hired him to do an IME on this case because they should have known what this guy was doing. They should have known. And again the man is making literally millions of dollars doing IME’s. Now, he gets caught lying. There is no other way to put it. He lied. There is no other way to make it nice. He said the IME took between 10 to 20 minutes. It took a minute and 56 seconds. Nice post. This is a great example of why procedural rules should allow video recording of compelled medical exams as a matter of right. I’ve made the argument repeatedly with mixed results in Oregon trial courts. The idea is that this exam is a legal proceeding that profoundly impacts parties’ rights, so a record is essential. Much of this would be avoided if recording were the norm. Video is a nice way of keeping things honest. This is very well done. I hope it does move our Attorney General to act to address something that’s been going on for too long. And while I feel like giving Judge Hart a spontaneous standing ovation for his candor, I take issue with his view that the defense attorneys and the carriers “should have known what [Dr. Katz] was doing.” They knew then. They know now. They will continue to know who to call on when they want victims’ rights and justice in general to be perverted in the name of “saving” money.Otherwise, Dr. Katz and his ilk wouldn’t be quite so popular in the insurance defense community. Incredibly, in federal court, you might not even get someone to go into the room with the plaintiff and doctor, leaving them alone. So there isn’t an eyewitness to what goes on other than the plaintiffs themselves, who generally don’t know what the doc is doing and are unable to take notes. Nice way to start the week. Well done. Originally Posted By David SugermanNice post. This is a great example of why procedural rules should allow video recording of compelled medical exams as a matter of right. I’ve made the argument repeatedly with mixed results in Oregon trial courts. The idea is that this exam is a legal proceeding that profoundly impacts parties’ rights, so a record is essential. Much of this would be avoided if recording were the norm. Video is a nice way of keeping things honest. The problem with this strategy as I see it is that these scum of the earth insurance “doctors” (at least the smarter ones) would do a nice exam, playing it up for the camera and still conclude there is nothing wrong with the plaintiff. The only way to catch these individuals is to surreptitiously video them. Love the byline. Says it all! Still reading it in its entirety. The defense lobby $pends million$ complaining about “insurance fraud,” and often gets a sympathetic audience for its whining. But here is a fine example of insurance fraud conducted on behalf of insurance companies, that hire doctors who are willing to lie and distort for pay by the insurance business. I hope the Attorney General and those who wave the “insurance fraud” banner are paying attention! Nice article. Would be nice to see articles in the mainstream press about this. Also, it seems to me that the insurance company should have legal culpability for forcing someone to see a “doctor” like this. I’m sorry but there are many plaintiff doctors who also lie on the stand and perform unnecessary procedures to build up bogus injury cases. These doctors run mills that treat all sorts of soft tissue injuries referred by plaintiff lawyers and they make mountains out of mole hills. Why doesn’t Judge Hart say anything about those abuses? He is o a biased pro-plaintiff judge like most judges who get campaign donations from plaintiff attorneys. Great investigative piece. The entire IME process is a bunch of b.s. I hope it results in justice. I am a New York attorney who has handled many workers comp claims for federal employees under the Federal Employees Compensation Act. Under FECA, the US Dept. of Labor has the right to force an injured claimant to see one of their “hired guns” so the claim can be reevaluated. I have seen numerous reports by both Dr. Katz and Dr. Israel. Both of these doctors issue adverse reports more than 90% of the time. They have caused a lot of damage to innocent employees. Thank you, Eric, for exposing these two. Under FECA, the US Dept. of Labor has the right to force an injured claimant to see one of their “hired guns” so the claim can be reevaluated. I have seen numerous reports by both Dr. Katz and Dr. Israel. The US Department of Labor had been hiring Drs. Katz and Israel? How does one sue the US Govt. for racketeering? Unfortunately this issue goes both ways for experts on both sides. I like the concept of panel exams where docs of multiple specialties are used for a single exam period. More expensive yes but claimant’s and insurers have the potential for a more objective and well-rounded exam. Video taping like with NYS WC exams while not fool proof would be helpful. Unfortunately this issue goes both ways for experts on both sides. Not really. Plaintiffs often rely on treating doctors that they find through their friends, family and the hospital they were taken to. Insurance companies, by contrast, work from the same list of doctors over and over. The plaintiffs’ doctors are a vastly more randomized selection of the medical community. Eric, it seems to me he should also be reported to the office of professional medical conduct (OPMC). I don’t see how he can’t be sanctioned or even lose his license. Great reporting. Excellent investigative work and reporting Eric. This problem with fraudulent defense side medical exams has been going on way too long. Bravo to Judge Hart for trying to do something about it. Let’s see if the DA will follow through and enforce our laws. Eric, you ask how does one sue the government for racketeering. I cannot answer you; that is not my field. However, depending on what supporting evidence I can gather, I may write to high level managers at the Department of Labor to tell them about Dr. Katz and Dr. Israel. Further, it seems only fair to me that if an employee had his claim denied based on a report by either one of these doctors, those cases should be re opened. Not condoning this behavior at all, but to suggest this was racketeering and insurance companies and insurance companies knew this was going on is absurd. When was the last time you saw a claims examiner or defense attorney present and observing on of these examinations? Also, at least be honest and acknowledge that medical fraud is equally if not more prevalaent on the plaintiff’s side. to suggest this was racketeering and insurance companies and insurance companies knew this was going on is absurd. The insurance companies have a financial interest in hiring doctors that give them favorable reports. That is, I believe, why you see the same characters over and over again. The doctors also have a financial interest in giving defense-oriented reports. Absurd? No, logical. As I indicated to another, plaintiffs often rely on treating physicians. This is a relatively random group, many of whom will be related to hospitals where the plaintiffs first seek treatment, or who go to various doctors because friends and family have recommended them. And that is in stark contrast to the rosters of doctors that insurance companies use, some of whom are raking in many hundreds of thousands of dollars (some more) each year from the medical-legal practice. False Claims Act claim under US and NYS laws. Doesn’t anyone realize that these “doctors” have also perpetrated a fraud on the carriers who pay them, by the hour? This is not collusion – the carriers are not present at the exam, they get the exorbitant bills these guys charge. Do we really believe the plaintiffs’ bars’ expert doctors are more scrupulous or spend more time with the plaintiff to render their equally biased opinions? Wake up folks! The doctors on both sides of the V. should be subject to audits. Doesn’t anyone realize that these “doctors” have also perpetrated a fraud on the carriers who pay them, by the hour? This is not collusion – the carriers are not present at the exam, they get the exorbitant bills these guys charge. Uh, yeah, sure. Let’s see, a doc is given a stack of medical records, legal pleadings, and at least one deposition transcript, then claims to digest all of that and do a 45-minute physical exam and write a report, and then charges a few hundred dollars? You do understand, I hope, that if corners aren’t cut somewhere that this is not a viable business model. Great article. Will the transcript from the July 9th hearing be posted? Will the transcript from the July 9th hearing be posted? I hope so, when I get it. I’m particularly interested in the exact language the judge used relative to forcing Dr. Katz to testify and holding him in contempt if he refuses based on 5th Amendment grounds. I can’t say with 100% confidence that we got it exactly right and I’d like to see the actual words. In my experience about 90% of the time if you tell me the injury and the law firm (at least with the bigger NYC plaintiff’s firms) representing the plaintiff I could correctly guess what doctors I will be seeing. Why is that? Because the plaintiff and the law firm have a financial interest in having a doctor that will give plaintiff-oriented reports. You can’t suggest that BOTH sides aren’t looking to have medical experts that will give them an advantage in the case and put the best possible spin on things. You can’t suggest that BOTH sides aren’t looking to have medical experts that will give them an advantage in the case and put the best possible spin on things. Defendants are organized with each major carrier having many thousands of cases. Plaintiffs are, by definition, very disorganized. The personal injury field is stuffed to the gills with small firms. Even the biggest of the firms is no match for just one Allstate or State Farm. I can’t continue to debate when you refuse to even concede that plaintiffs seek out doctors they believe will be favorable to them. To say that plaintiffs are “by definition disorganized” is a laughable statement. Basically every local bar association is de facto run by the plaintiffs’ bar, the plaintiffs’ bar singlehandedly funds the judges’ campaigns and goes to their dinners, etc., and you guys basically have the run of Albany. I wish the defense bar was so “disorganized”. I get that you’re a plaintiff’s attorney and this blog is a marketing tool for you, but if your view of this issue is so myopic that you can’t even admit both sides are doing the same thing, then I guess you can just continue to preach to the choir and I’m wasting my time here. Good luck to you. To say that plaintiffs are “by definition disorganized” is a laughable statement. Basically every local bar association is de facto run by the plaintiffs’ bar, the plaintiffs’ bar singlehandedly funds the judges’ campaigns and goes to their dinners, etc., and you guys basically have the run of Albany. Just think for a moment about the vast resources of the Fortune 500 and compare that to resources of consumer groups. Go ahead, think about it. Do an analysis. While agree that some plaintiff firms may seek certain doctors, many plaintiffs and their attorneys rely on the treating physicians. One challenge that plaintiffs and their counsel face is that frequently, treating doctors do not want to get involvled in a lawsuit and/or do not know how to write a narrative report. They are not “hired guns” like defendant’s doctors are. While I agree that some plaintiff firms may seek certain doctors, many plaintiffs and their attorneys rely on the treating physicians. One challenge that plaintiffs and their counsel face is that frequently, treating doctors do not want to get involved in a lawsuit and/or do not know how to write a narrative report. They are not “hired guns” like defendant’s doctors are. There is a false equivalence argument here that misses the mark. The issue is fraudulent examinations. Full stop. I agree with Turk that there is are major differences between most plaintiffs’ firms and AllFarm Insurance. That said, yes there are some abuses on the plaintiff’s side. But only a rank partisan would somehow try to excuse this fraud and abuse by a false equivalence argument. Most of us who see abuse on the plaintiffs’ side call it out. It’s bad for the system, for those of us who play by the rules, and for clients and consumers who are in the civil justice system. So we whistle fouls. That anyone tries to defend or excuse this conduct is sad. Regardless of which side of the v you haunt, you owe a greater duty to the civil justice system. So stand up for that or shut up. Fraud is wrong and it happens on both sides of the “v”. I have a case right now where I recently received records from a treating doctor and included in there is a fax from the plaintiff’s attorney providing a doctor with an entire “suggested” paragraph for the doctor’s report (which to the doctor’s credit he ignored). I would never condone the behavior of these doctors. I am in charge of expert selection at my firm, and would never jeopordize my career or the career of any of my associates and get in bed with doctors like these, and I believe most defense attorneys feel the same way. I try to use doctors who still have an active practice and treat patients and don’t get most of their income from being an expert. If I wouldn’t feel comfortable referring a friend to a doctor as a patient, I wouldn’t use him/her as an expert. This post and the comments demonize all of us in the defense bar and I take offense to that. That is all. This man should be stopped. We had the misfortune of having the IME performed by him. The exam was very quick. He actually hurt my daughter. He was extremely rough and we called it a physical assault. He was extremely condescending to the Attorney. I have found that the Department of Labor does not investigate or even respond to complaints regarding these DME Docs. Defense Base Act Claimants have been forced to attend Psychiatric Interrogations with the infamous Dr John Dorland Griffith for years now, despite his having been exposed by several ALJ’s. Mr. Bower: Let he who is without sin cast the first stone. It so happens that the plaintiffs bar sends there their clients to medical office enablers otherwise known as “mills” who will also make “favorable” findings for plaintiffs. If you do not know that then you do not know this business. Those familiar with the IME industry know that a verbal confirmation of the mechanism of injury is important to the case. Plaintiff’s lie all of the time (even under oath), and medical records consistently conflict or are inaccurate (particularly with the new EMR system). Re. time spent on exams, (notwithstanding the accusation of perjury),I fractured a wrist and a pinky – the physical portion ONLY of each follow up exam (with accurate range of motion performed)were approximately a minute. Of course, coming from a personal injury lawyer I would expect nothing less. Sorry, but attacking the messenger is a lousy way to argue. It was the judge that called Katz a liar. yeah, that would be perjury if done under oath and insurance fraud. That is what I’ve been writing about. My husband was involved in a MVA… he received a barrage of phone calls from “doctors” who were told he was involved in an accident and suggested he “treat” with them. You get no argument from me that there are some unscrupulous doctors. Actually, your comment is, as it happens, pure speculation since you provided zero proof. Unlike the individual doctors who might commit fraud, I’ve been addressing a systemic problem that goes on a mass scale and involves the insurance companies themselves. I’m not yet done with the series. I’m an individual who works in the medical field who has reviewed thousands of medical files, BOPs and EBTs to know the depth of corruption perpetuated by “attorneys” draining every American with these bogus lawsuits. What flavor Kool-Aid is that in front of you? Of course, if you want to name names in order back up your claims, by all means do so. But if you defame someone, don’t expect me to defend you. Feel free to talk about that somewhere else, since that is not the subject of these postings. I agree completely. I have found over the years that the Dept. of Labor has ignored my arguments, and it is very hard to challenge the credibility of these hired guns. Even if a particular hired gun seems fair, oftentimes the treating doctor has seen the patient many times over the course of several years. The IME doctor sees the claimant once for 5 minutes and, abracadabra, the IME doctor’s opinion is seen as carrying more weight. Eric: You have done it again! An outstanding job on reporting the transgressions that keep on comming from the insurance defense bar and its corrupt agents (example IME doctors) who will stop at nothing to win a case!!! G_D Bless you Eric for your outstanding work you are a credit to the Plaintiff’s bar. The fraud begins with the term “IME”. The California Code doesn’t use that term. It is simply called an “examination”. Defense attorneys and their insurance doctors continue to reference the “independent medical examination” during trial. When plaintiff’s counsel asks,”What is independent about it?”, the explanations given in their depositions is laughable. Did you obtain the transcript where he lied and was confronted with the video? If so, can you post it to help others dealing with this guy going forward? I do have it. But I appear in this court on a regular basis and if I post too many transcripts the court reporters won’t be happy with me, as it would appear I am taking away their bread. And I really don’t want the reporters in the courthouse mad at me. But I will tell you that Dr. Katz wasn’t confronted on the stand with the video. His testimony was locked down, and then a paralegal took the stand who had attended with the plaintiff and she testified as to her timing the exam on her own, and that the attorney had also videoed the exam. That is when all hell broke lose. Why are the insurance carriers required to retain the IME doctors. Seems pretty obvious to me??? I have been injured and had two surguries with one more coming and my IME doctor in Port Jefferson, N.Y. has never spent more than 2-3 minutes with me and writes a multi page report. The last one on 5/23/13 stated 75% disibility and may continue normal daily living activities and work duties with restrictions. He should not lift more than ten pounds. She also noted three arthroscopic scars of my right shoulder. Not mentioning the 5-6″ scar there from my recent total shoulder replacement. She obviously has a history of long reports after spending aa few minutes with her “victims” because I was fore warned of reputation. Workers Comp should pay for the IME being the only independent party involved in comp cases. On a whim, I felt like googling Dr. Michael Katz’s name and came across this. I felt obligated to leave this, for it was about a month ago that he did an exam on me in under 5 minutes with minimal being done (I should know, I am a retired Doctor). But I also thought it was very funny when kept on insisting that I put my phone away. Strange and obviously paranoid. This guy is a disgrace to the professions and it is a conspiracy when the carriers know what he does and still hire him for the result that they are looking for. I replicated this post after noticing that I originally had misspelled my email. Great story Eric!